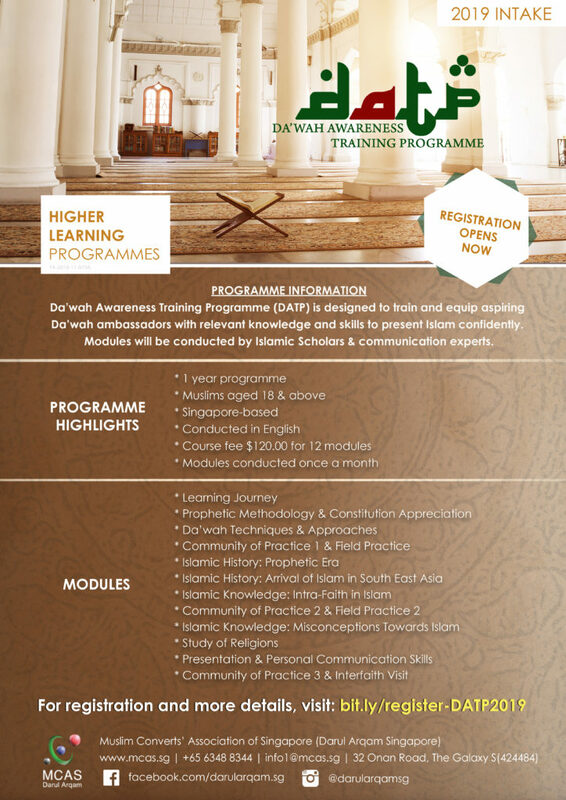 Da’wah Awareness Training Programme (DATP) is an initiative by Muslim Converts’ Association of Singapore to train and equip aspiring Da’wah workers, age 18 and above, with relevant knowledge and skills to present Islam confidently to the world. Nowadays, the image and perception of members of other faiths towards Islam is influenced by the media. It is the responsibility of all Muslims to show the world the true values that is promoted by Islam. Hence it is essential to learn and acquire the right knowledge first. Da’wah Awareness Training Programme provides the platform for Muslims to gain expertise to perform Da’wah. At the end of the programme, participants will be able to share with their friends and family about Islam and show the positive side of Islam beyond the media stereotypes. The programme consists of 12 modules over a one year period. Students are expected to attend every module and will need to attend 7 modules to complete the training programme successfully. All modules will be conducted on either the third or the fourth Saturday of the month. The dates for the modules will be informed to students during the first class. However, the organisation reserves the right to alter the timetable according to circumstances. Don’t miss the chance to experience this comprehensive training programme, tailored to turn participants into confident ambassadors of Islam!